Newly released body camera footage shows an Arizona police officer being killed by a suspect who drew a gun on the cop and fired at him six times. The 14-minute video captures the entire moment when 24-year-old Flagstaff Police Office Tyler Stewart was shot by Robert Smith. 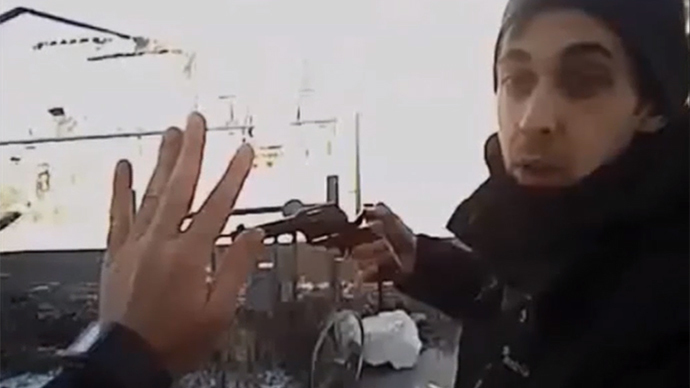 After shooting the officer dead, Smith then turns the gun on himself. The footage was released in response to Freedom of Information requests. The tragic story began on December 27 when Smith’s girlfriend phoned the police to complain that he had trashed her apartment. In response to the call, Stewart turned up at the girlfriend's home to find that Smith had fled. The rookie cop then went to Smith’s own home, and was told by his roommate that he wasn’t there either. Police records indicate that at 12:30 p.m., Smith called the Flagstaff Police Department himself and left a message for Stewart, who then drove back to Smith’s home. Stewart and Smith then talked outside Smith’s house for about three minutes. Smith was standing with his hands in his pockets. When Stewart asked him if he had any weapons, Smith said he was “just cold” and only had “smokes” in his pockets. In an unusual move, the young cop did not demand that Smith put his hands up or get on the floor. Instead, he calmly asked if he could check him for weapons. At that point, Smith took out a 22-caliber revolver and fired at Stewart six times. Five shots hit him, four of them in the head. Smith then shot himself. Stewart died later in hospital. According to police reports, Smith’s roommate later told police that Smith had been thinking of suicide. “Officer Stewart was murdered by Smith without any provocation or warning. There were no homicidal or suicidal indications from Smith prior to the crime” Sgt. Margaret Brentzen told the Arizona Daily Sun. The disturbing video comes as the US Justice Department pushes for police departments around the country to invest in body cameras, following a number of high-profile cases where police have come under intense criticism – particularly after the shooting of unarmed black teenager Michael Brown in Ferguson, Missouri, last August. The release of the footage has also sparked debate about the balance between protecting the privacy of police officers and their families and the public’s right to know. "We are currently crafting or looking at legislation that may very well discuss this. We acknowledge that the public and the media should have access to this information,” said Levi Bolton Jr., executive director of the 14,000-member Arizona Police Association.